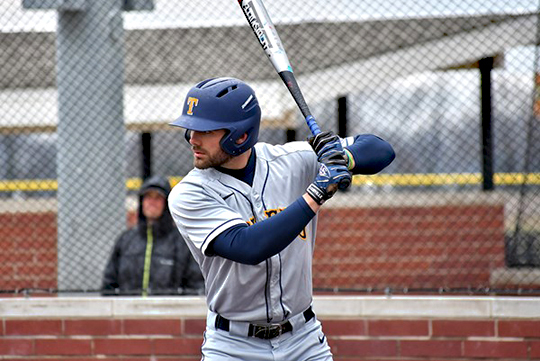 Former Toledo baseball player Ross Adolph was named a third-team American Baseball Coaches Association/Rawlings All-American on Saturday. Adolph becomes the sixth All-American in program history, joining Roger Coe (1974), Mitch Maier (freshman 2001, 2003-04), Sean Dobson (2004), AJ Montoya (freshman, 2015), and John Servello (freshman, 2018). Adolph, a first-team American Baseball Coaches Association/Rawlings All-Region selection, recently became the 46th player in school history taken in the Major League Baseball draft. The 12th-round selection by the New York Mets wrapped up one of the best seasons ever by a Toledo hitter. The first-team All-Mid-American Conference and All-MAC Defensive Team selection tied the program’s single-season home run record in 2018 with 15, tied for most in the league. He also led the MAC in RBIs (56) and was tops on the squad with 50 runs scored, 69 hits, 12 stolen bases, a .654 slugging percentage, and a .445 on-base percentage. He became the first Rocket with double-digit home runs since 2010 (Jared Hoying and Dan Sherwood, 10). The Findlay, Ohio, native was one of two MAC players named an All-American by American Baseball Coaches Association/Rawlings, joining former Kent State pitcher Joey Murray. This entry was posted on Monday, June 18th, 2018 at 3:00 am and is filed under Athletics, News .